1. ranger alcohol inks: if you read my blog then you know that i am borderline obsessed with alcohol inks! they are super fun and so versatile! 2. ranger alcohol ink blending pen: this really goes with number 1...i've just learned how to watercolor/paint with alcohol inks using this pen and i love it! 3. transfer foil: gold still has a special place in my heart, a big place on my craft desk and one of my favorite ways to add gold is with transfer foil. 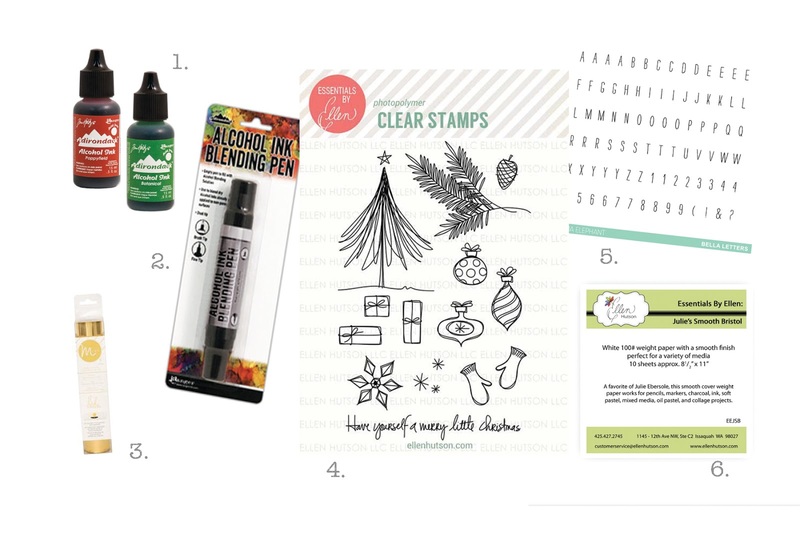 4. essentials by ellen christmas scribbles: this stamp set is one of my favorites! it is just so fun! 5. mama elephant bella letters: these letters are perfect for creating custom sentiments and they coordinate especially well with the cute sentiments in the essentials by ellen merry & bright set. 6. julie's smooth bristol: my favorite paper! perfect for watercoloring and the BEST for ink blending. p.s. it's ellen hutson llc's 9th birthday this weekend plus i think i heard something about black friday maybe...lol! so make sure to check it out this weekend!